1.3 mile ADA compliant asphalt walking/jogging trail that winds around a 10-acre lake. The trail features memorial benches, bricks and greenery along the path. The trail offers pedestrian lighting for evening patrons and features a scenic tour of the entire Enterprise Recreational complex. 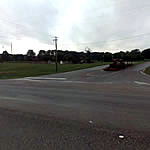 From the AL Hwy 84 Bypass or Boll Weevil Circle; the park is located on Hwy 167 N. Toward Troy; AL on the left side of the road. The trail is immediately on the left upon entry into the park. No motorized Vehicles, skateboards or bicycles.